4th dcd and the 3 peaks. 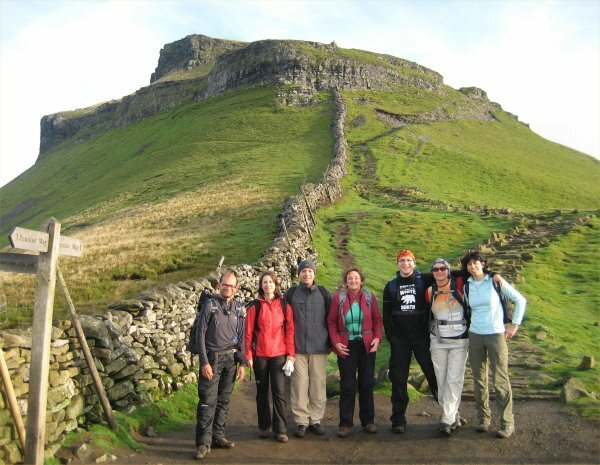 The 3 peaks in Yorkshire is one of the hardest “pleasure” walks in the UK. Unlike the UK 3 peaks, there are no stops in between to drink tea in cars. Its one long run, with 3 progressively higher mountains, a long walk between the 1st and 2nd mountains and a backbreaking slog to the village, once the final peak has been bagged. I walked it in my 30’s with Frank and Dave Mandy and it half killed me. Tony was really keen to do it, so off we went. We rented a car from Avis for 3 days, at a cost of only £42 (but beware, when you bring the car back, unless its completely full, you’ll be charged for a full tank). Tony came down on Thursday night, to sample the social scene in Chester, and so that we could set of early on Friday. I haven’t been camping in a while, and I was surprised how quickly you lose the packing skill. It took me ages to decide what things to take, when previously, it would have taken only a few minutes. More proof, were it needed that I need to get back to previous adventure habits. For various reasons, lots of messing about in the morning, meant we didn’t set off, until after lunch. This was for the best really, as the weather was utterly atrocious. We got up to Horton, put up our tent and had a walk around. It was at this point, I realised they had a bunk house, which we should have used rather than the tent, but what the hey. The farmer kindly gave us Sausages and burgers (I didn’t eat them on the trip, but they fed me for 3 days when I got back !). We had a couple of coffee’s in the Crown in (Horton is served by 2 pubs, the other is the Golden Lion). Tony had invited some friends from Social Circles (an outfit based in Manchester that organize regular social events, walking trips and holidays etc) who were going to join us. They arrived a little late, as they had experienced problems getting a spare tent, car breaking down and having to rent another one etc. All in all, I was impressed with their tenacity. As I’ve written before, the real challenge for me is not getting out of the tent and walking the mountain, but the night before. You finish work, are presented with the options of leaving your comfort zone, getting on buses, carrying bags about etc, versus going home and relaxing in your house, meeting up with your friends. Its all too easy to choose the 2nd one, but despite the prospect of driving rain and the night in a tent, they had got there all the same. After getting something to eat in the pub, we wander back to the tents and bed down for the night. It was quite late, and a male group, who had been drinking heavily in the bar, decided to extend the party until 2.30am, which wasn’t appreciated. Up in the morning, we use our stoves to make coffee and then fill up the flasks. Some people opted for porridge I had a continental breakfast as I was keen to get on the hill. I was under no illusion about the walk. You need 2 things to get up a hill. Fitness and determinations. If I could only choose 1, it would be the 2nd. As Twid told me on my mountaineering course at PYB, sometimes you just put up with the pain and keep walking. I’ve lost a lot of weight lately, but Tony and everyone else on the trip, were much fitter than me. We set off, and you can see from the picture, the weather was fantastic. I had brought my map, compass and gps, but Kosia who leads a lot of the Social circles trips, was all over it, and I was very impressed with her leadership and navigation. After Penny-Ghent, its a very long walk to the next mountain, which was really boggy from the previous days rain. I took the picture above, to try and capture the feeling on the trail. We had a couple of stops for drinks and lunch. It was really nice meeting new people. Kosia it turned out, was from Krakow, one of my favourite places in Poland. An Italian friend of her’s was from the Italian alps near Lake Garda and Cortina. A couple that joined is in the morning were scientists, and we had a long talk about whether discovering aliens (or them discovering us) would bind humanity together or finish it. 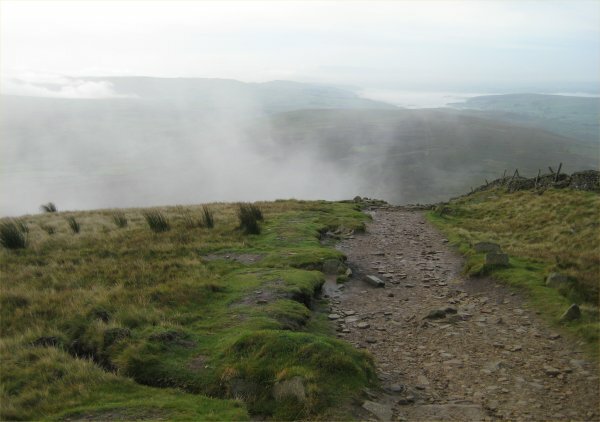 Whernside is different than the other 2 mountains, as it has a sort of elephant back, that stretches for miles. It was a real slog getting up there. Once down the other side, we made our final march to Inglebourough. We stopped off in a pub to get a drink and use the toilet. They told us we weren’t appropriately dressed. I pride myself on the versatility of my Rohan clothes, but how many walkers wear a shirt and tie !. 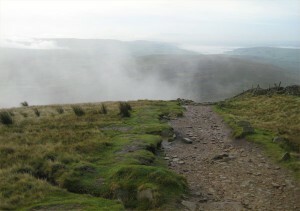 The final mountain Ingleborough is really steep, and has steps cut into the mountain, to avoid accidents. The top of the mountain is a large flat area, I saw the group, and realising success was in sight, took off, with renewed vigour. 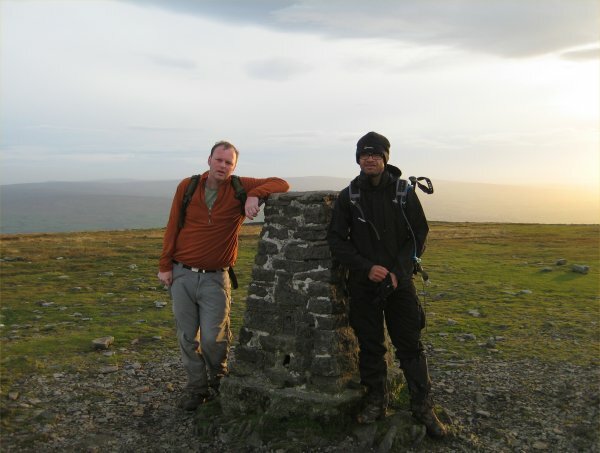 I get a picture of me and Tone, at the the trig point. Its now time to head home. Its a really long walk, not well sign posted, and darkness was closing in. I set of as fast as I could, I was conscious I had arranged to meet my Aunt and Uncle that evening for dinner at their house. As I headed down the hill, my Uncle asked how long I would be, and gave directions on the quickest way back. Navigating back is pretty easy at first, as you can see lights from the village. The path descends into a sort of basin and once your lower then the village, you cant see anything (there is also a sign that says 1.5 miles to Horton, which must have been put up as a joke). We get back to the village, and too my suprise, my Uncle is waiting for me at the Railway station. We say goodbye to the Social Circles crew and drive back to Uncle John’s house (he owns a cottage in Horton). Take of our boots in the garage, and within minutes, I’m sat on a comfortable arm chair, in a warm living room, with a glass of cold beer. Heaven. More is to come, when we sit down to a warm filling meal, that they’ve cooked for us. I only see my Uncle John every few years, so we sit up until after midnight talking. A warm shower and then a well needed nights sleep in a comfortable bed. In the morning, a full English breakfast, then say goodbye, and head to the campsite to take down our tent, and drive home. I drop Tone off at his house, and then drive back to Chester. That’s when it hits me. Before Frank moved to Thailand, I could think of any kind of adventure, and know I would have someone to come with me, with all sorts of organisational skills, a sense of humour and a general love of getting out there. I have been looking for someone like that since then, but it isn’t Tony. No, in reality its the other way around. 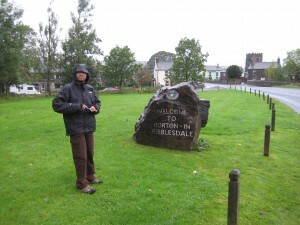 Tony had a dream, and the drive and determination to do the 3 peaks and I helped to make it happen. I haven’t found a replacement Frank, I have become Frank and Tony is the old me !. Thanks to everyone who came, especially Kasia who was an inspiration. Also my Aunt Vernica and Uncle John for their much appreciated hospitality. Oh, nearly forgot Tony, sorry. 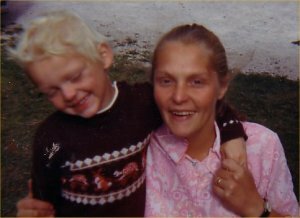 My mum passed away earlier today. Everything on this website and all the adventure I’ve done came from my imagination, which came from her. The search for adventure will have to stop for a little while.